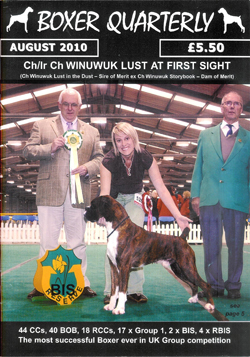 Over the years, the partners in the Winuwuk Boxers have written many articles and features on the breed. This culminated in Ivor being asked to write a book for Crowood Press in the late 80s and Tim was then asked to write one for Ringpress a decade later. Both were very well received and they were the subject of excellent reviews in the dog press. "A quite outstanding part of the book is in the 17 page long interpretation of the Boxer Breed Standard which expands and discusses the many points and other matters that go to the making of a good example of the Boxer. There is a great deal to be learned about the dog and its conformation, no matter what its breed, from this fine piece of writing. The chapters on getting started, breeding, choosing a puppy and assessing the Boxer are also first class, going deeply into points and matters that are so often, in breed books, more lightly discussed than in this excellent piece of writing. It is very evident that this book is written by a most knowledgeable breeder." The book is now exceedingly hard to get hold of, and something of a collector's item, so snap one up if you see it! "When I opened The Complete Boxer I was so captivated that I did not want to put it down. At a first cursory glance the excellent illustrations compelled me to read this book from cover to cover, and what a rewarding experience this turned out to be. Here we have an erudite text book on Boxers which covers the whole Boxer scene from those first beginnings a century ago in Germany to the present day worldwide. Tim Hutchings, despite his comparative youth, is now a well-established figure in the Boxer scene, thanks to the kind encouragement of his mentors whom he rightly acknowledges. 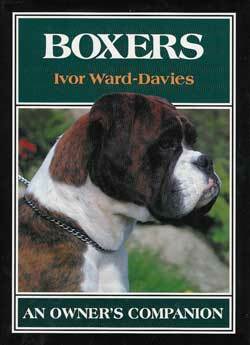 Ivor and Marion Ward-Davies have given him opportunities to pursue his life interest in the total Boxer world and his highly readable book takes us through the gambit of the joys of owning, breeding and showing this very endearing breed. The Complete Boxer amply fulfils its purpose in introducing the breed newcomer to all aspects of ownership but it is obviously a work born out of love and will not only educate the newcomer but it will appeal to old stagers like myself, who have been around for more years than we care to remember. The Complete Boxer is just that: complete and full of sound common sense. It is not only a mine of information for the beginner; it gives a chance to look at the past, assess the present and look forward to the flourishing future of this uniquely special breed and is particularly instructive to breed judges, aspiring or established. 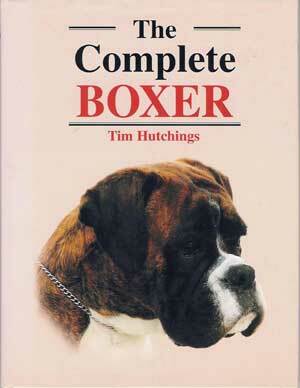 I urge anyone interested in Boxers to add this book to their collection. The author's knowledge and enthusiasm fill every page." With Eddie Banks and Keith Jump, Tim Hutchings is the joint owner and editor of this popular magazine. It is produced three times a year in March, August and November and it has a circulation that touches over 30 countries world-wide. Eddie, Keith and Tim have owned the magazine since March 1994 and it goes from strength to strength with over 20 editions produced so far. It is a 'must' for all Boxer lovers.